I think I love this game. And I think I vastly improved its looks. It’s based on a recently invented game (2008) called Kamisado. The game’s original colors, both the board and matching playing pieces, are garish and unimaginative, looking like they’re straight out of preschool tempera paint tubs. You should read the reviews; some folks get flat bilious even looking at the game board and refuse to play it! I wanted to improve on that at the very least and worked hard to develop a pleasing cohesive palette of jewel tones and to give them a setting that would make them glow. And, yes, if you’re a fan of the checkerboard’s b/w rhythmic contrasts, a fantasmic multi-colored board might throw you off. Even a pretty one. BUT! It’s the color that drives the gameplay and that makes this game artsy to begin with. Hence my title of Color Theory. There are eight different colors and each one appears in each row and each column in the 8×8 grid. And there are eight matching colored playing pieces for each side which start on the opposite end rows resting on their matching square. Black and White loopy grips define each side’s pieces. The goal is to be the first to move one of your playing pieces to the opposite side of the board. Game descriptions say that can take about 30 minutes of playing time because both you and your playing companion drive each other’s moves. Whatever color square I land on, YOU must move your playing piece of that color. And you are doing the same to me. Only forward moves. Diagonals OK. No jumping. It can get complicated! The game is fun played in a Best Of series, but you nascent Color Theory geeks out there should know that there are further levels of play using movement advantages that winning pieces earn (much like crowning a winning checker.) I had to stop myself with the basics. To make this art piece, I was attracted to the found object wooden tray as a support and sized the 64 ceramic tiles to shrink to fit. Sparkly glued black sand fills the spaces between the tiles. 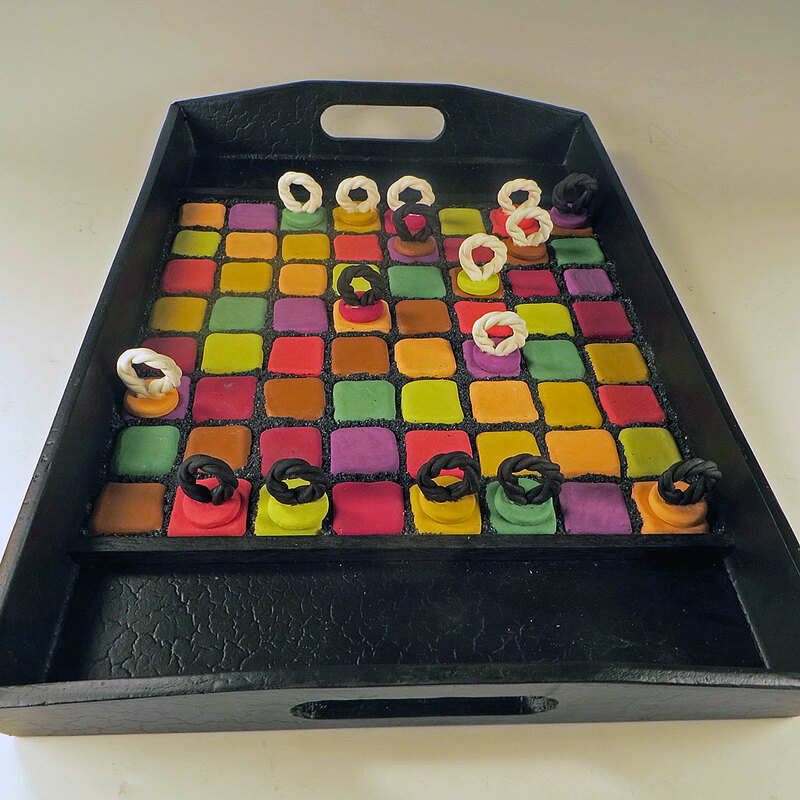 To resonate with the serving tray, I originally thought the playing pieces could be cute little trompe l’oeil canapés which matched the color of their squares. You know, like a slice of smoked salmon on a tiny cocktail bread base to match the salmon-colored tile? While I soon ditched that idea as too fussy in every way and returned to the simplicity of just using the pure colors, that’s a good example of my Sweep/Encircle/Discard creative process. Besides Beauty and Cohesiveness, as with all the art works in this series, Functionality comes into play (pun intended!) Are game elements the right size? Are they comfortable to hold? Do they move easily and stay where they are supposed to? How fragile are they? How sturdy? Do the game elements work well together? How a ceramic creation such as this fares in use is subtle and complex and just as important as a great handle and smooth rim are to a mug. It helps to have a consulting Senior Game Designer in the family. (More on that in coming posts.) After I dropped the canapé idea, the simple twisty loops idea appeared and added exactly the right feel in use as well as sculptural interest on the board. To geek-out on Color Theory basic play or strategy, check out the red colored links throughout this post and you’ll be close to Abstract Strategy Game Nirvana. –Liz Crain, who enjoys the “game” of making visually and technically intriguing ceramic fusion board games. Brilliant! Love everything about this…your exhibit will be a huge success!! Thank you Jan! It’s funny but completely normal to experience some hesitation before big events like this. Your enthusiasm helps me maintain balance!